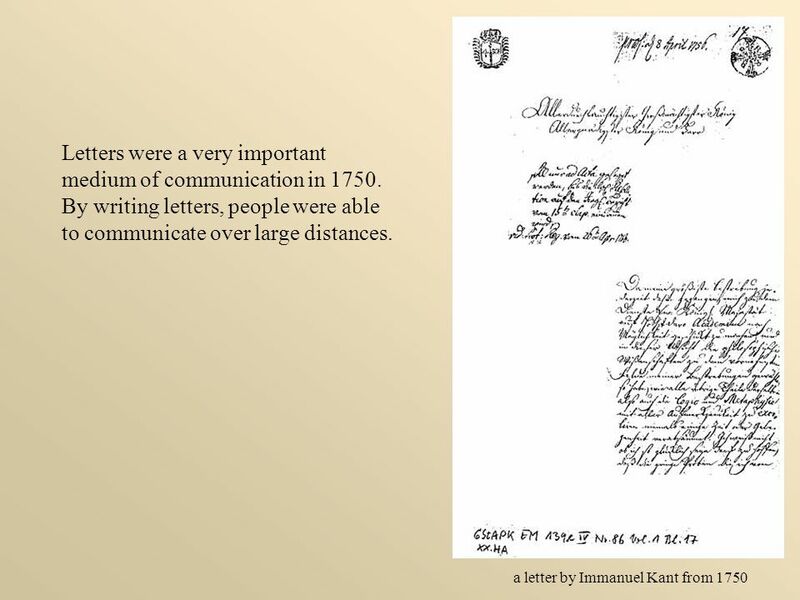 2 Letters were a very important medium of communication in 1750. 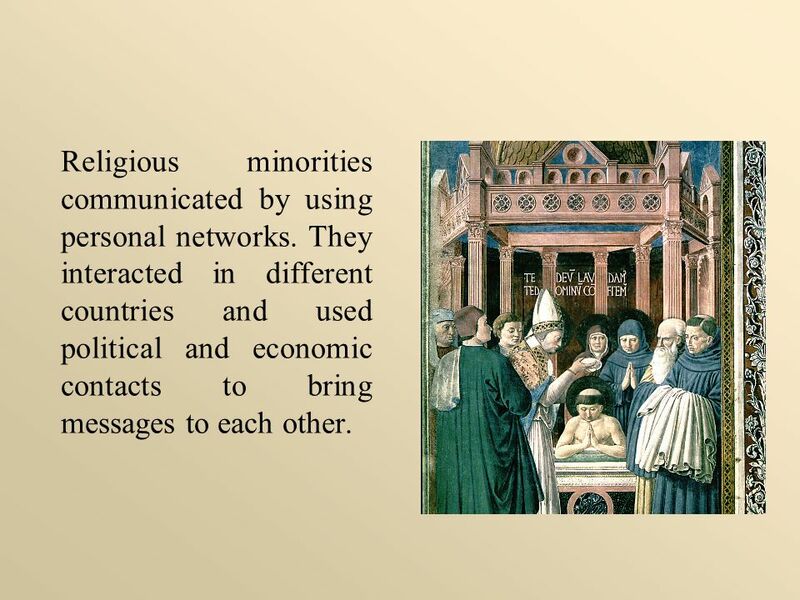 Religious minorities communicated by using personal networks. They interacted in different countries and used political and economic contacts to bring messages to each other. 4 The jewish community in Prague sent letters to other communities. 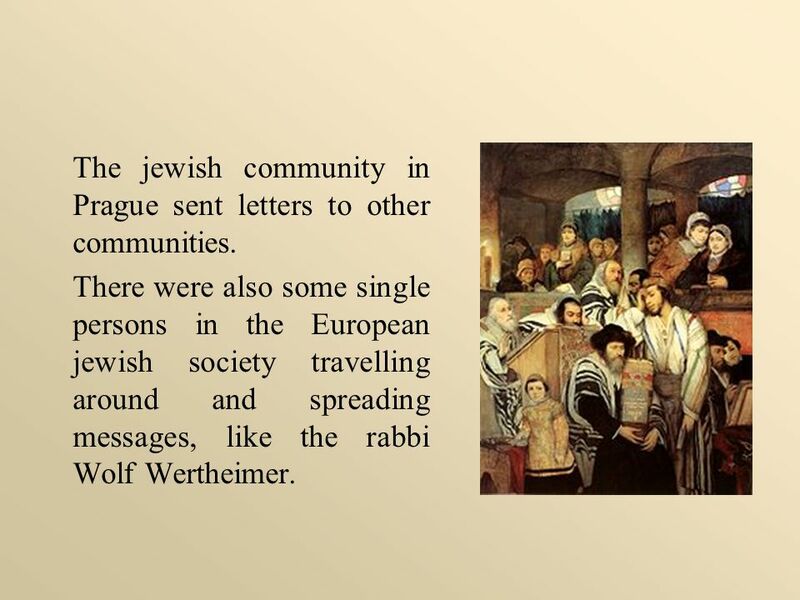 There were also some single persons in the European jewish society travelling around and spreading messages, like the rabbi Wolf Wertheimer. 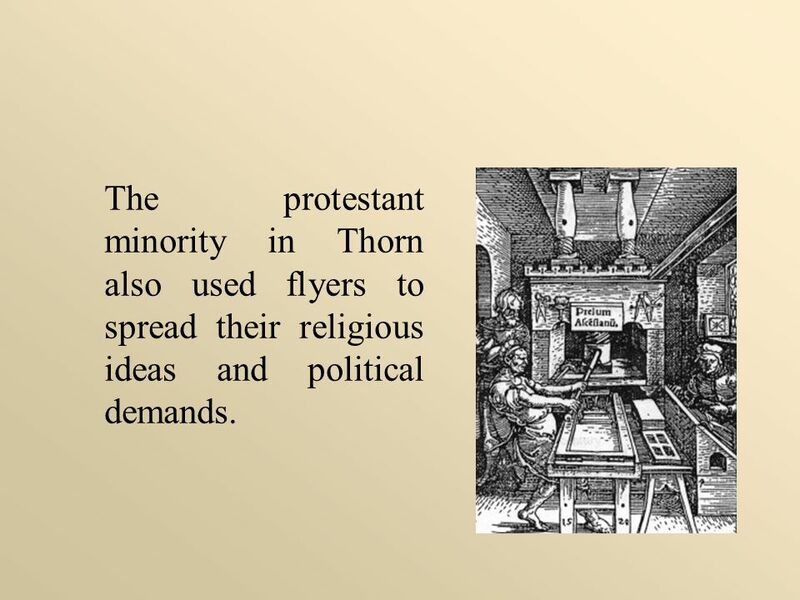 5 The protestant minority in Thorn also used flyers to spread their religious ideas and political demands. 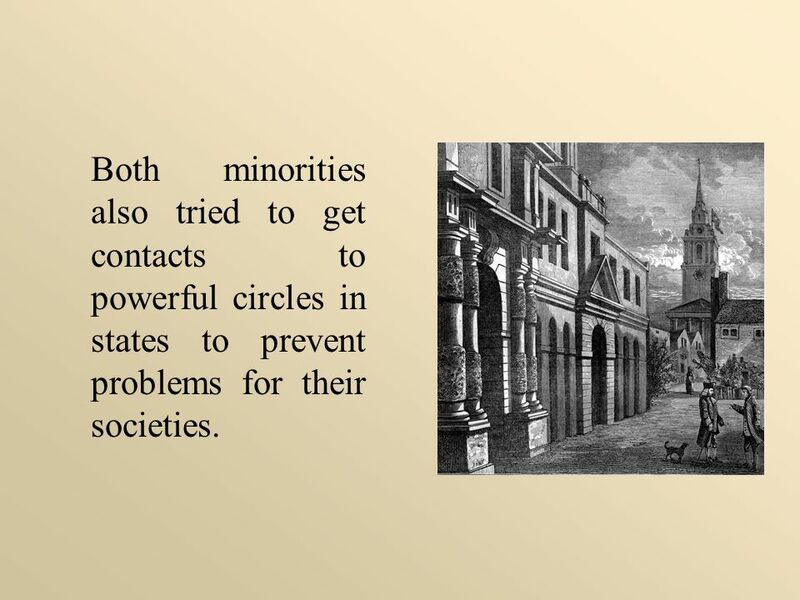 6 Both minorities also tried to get contacts to powerful circles in states to prevent problems for their societies. 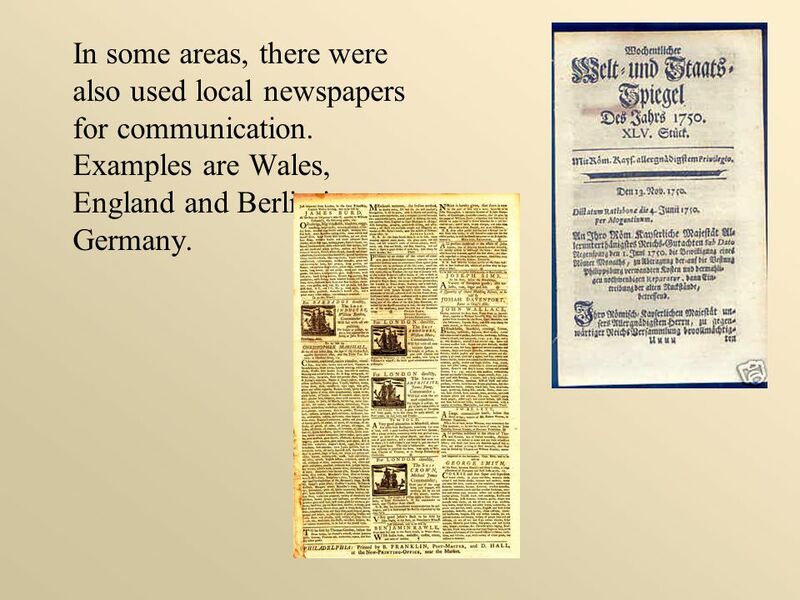 In some areas, there were also used local newspapers for communication. 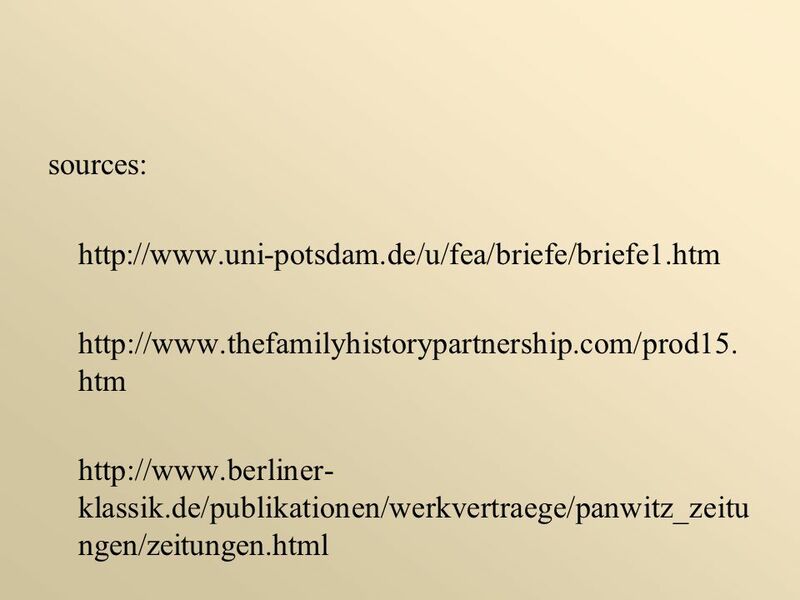 Examples are Wales, England and Berlin in Germany. 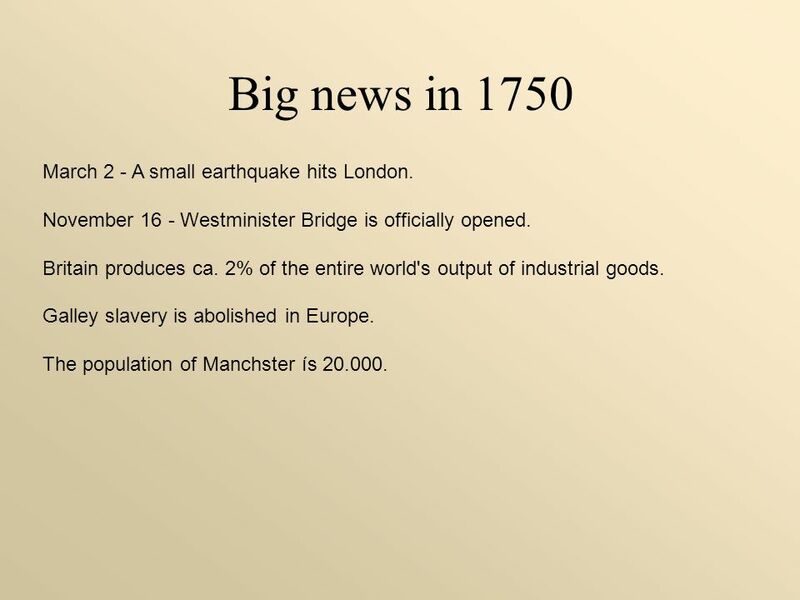 8 Big news in 1750 March 2 - A small earthquake hits London. 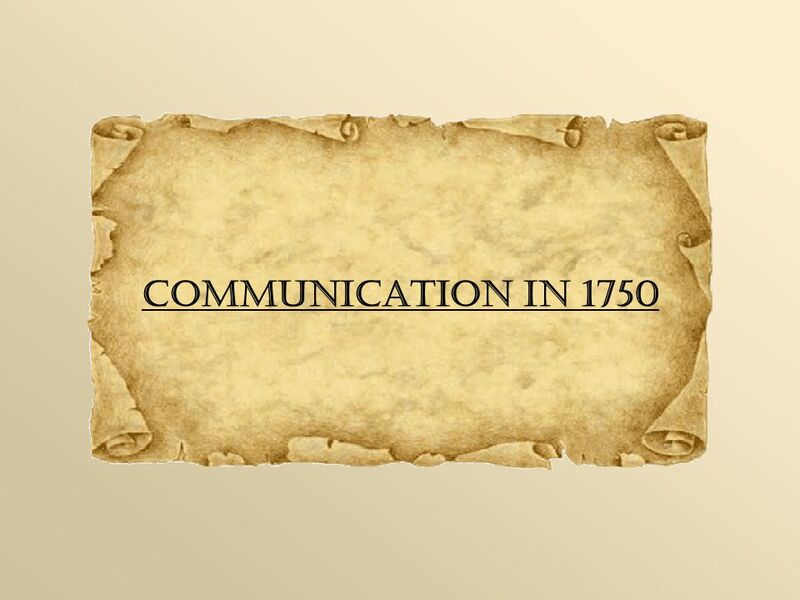 Download ppt "Communication in 1750." Magnetic Travel By Matheus Oliveira AndDaniel Yelamos. Introductory Task What term means a belief in the importance of traditional values and competition? What term means the idea that human behaviour is governed. index.html index.html Come in, sit down, get out thirty laws and have a seat! Arts Festivals’ Declaration on Intercultural Dialogue European Festivals Association. Britain Leads the Way Ms. Ramos. Why England First? Ms. Ramos. Name: Peter Stack Country: European Union PARIS LONDON ROME DUBLIN. The Reformation and Christianity Effects of the Reformation The Big Idea The Reformation changed religion in Europe and led to political and cultural. FORMS OF IMPERIALISM DIRECT RULE INDIRECT RULE PROTECTORATE SPHERE OF INFLUENCE Colonial power bring in their own officials and soldiers to administer. Pennsylvania Becomes A Multicultural Haven Chapter 3 Lesson 8 – Foundation for Religious Freedom Lesson 9 – Multicultural Haven Lesson 10 – Multicultural. UNIT 2 Africa History Study Game Europe’s need for Raw Materials led to what? The “Scramble for Africa”? Why 1450? Ottomans Conquer Constantinople Why 1750? Industrialization to Imperialism Project Objectives – Understand how the development of Industrialization of the 1600 and 1700s leads to Imperialism in. Section 3 The Atlantic Slave Trade To meet their growing labor needs, Europeans enslave millions of Africans in the Americas. NEXT.